As you can see, I scaled down the sketch a bit to give more room for that gorgeous background patterned paper from Basic Grey's Highline collection. 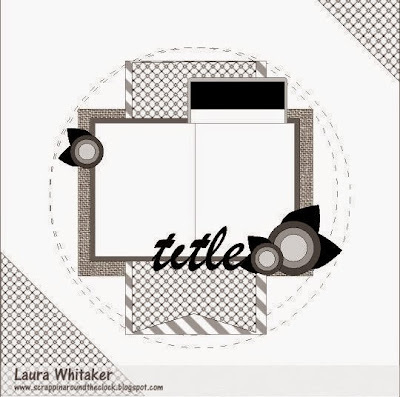 Actually, most of what you'll find on this layout is from that collection - patterned papers (12X12 and 6X6), snippets, stickers, chipboard stickers, and photo frames. 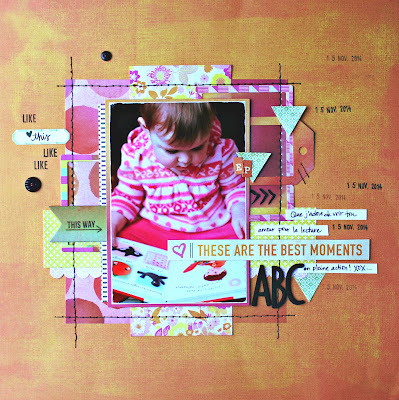 I also added some American Crafts and October Afternoon alphas, Crate Paper rub-ons, Stampin' Up cardstock, Basic Grey buttons, stamping using a Close-to-My-Heart stamp and some StazOn ink, Making Memories staples, and of course, hand-stitching using a Crafter's Workshop stitching template and some DMC floss. Want to see what the other design team members came up with for this sketch? Just hop on right over here! And when you design something yourself using this sketch, please link up an image of it to today's reveal over at Stuck?! Sketches. 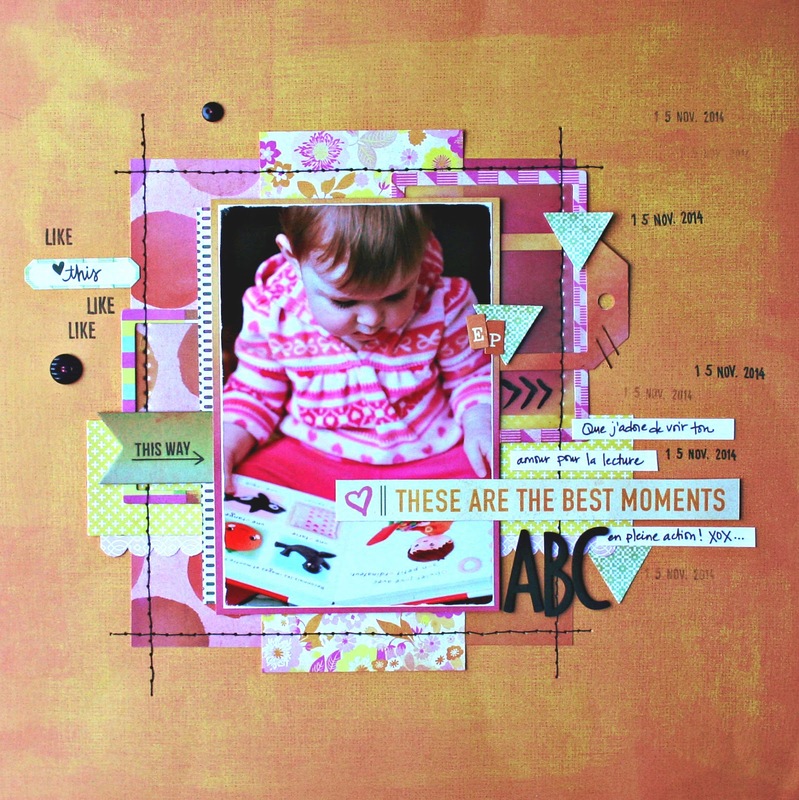 You'll get a ballot to win some scrappy loveliness from Minnie Blooms Mixed Media Products and ScrapMuch?. YAY! I had been waiting to try some tone on tone die-cutting for some time now. I worked with Ashley's X file die-cut and Basic Grey's RSVP collection - patterned papers, flags, wood die-cuts, stickers, and alphas. I also used a Jen Hadfield by Pebbles title sticker, a Studio Calico script transparency, a Christy Tomlinson rubon by Pink Paislee (which I actually cut in three pieces to spread it more evenly through the design), splashes of Heidi Swapp Color Shine and Tattered Angels Glimmer Glaze and hand-stitching using a Stampin' Up stitching template and some DMC floss. Oh! And I just noticed a wee, little resin flower on that flower... a gift I received at a crop - manufacturer unknown. Photo by Philippe Dumas. Wanna see what the other Stuck?! Sketches design team members came up with this time around? Hop on right over here and be prepared for some scrapsensational inspiration. 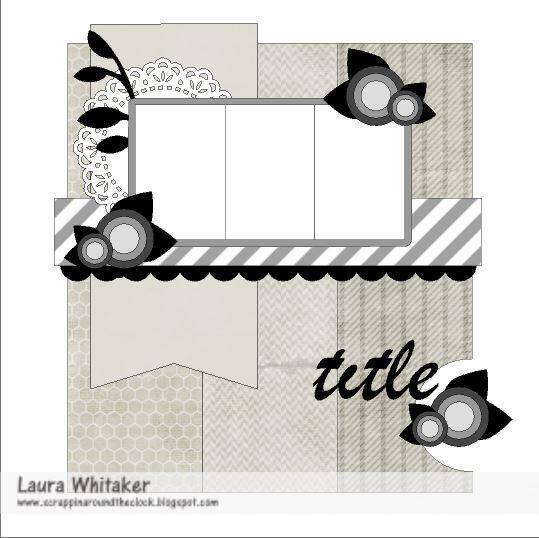 And if you design your own layout based on today's challenge, please link it up to today's reveal over at Stuck?! Sketches. You'll get a chance to win some scrappy loot from Scrapmatts and Scrapbook Circle.